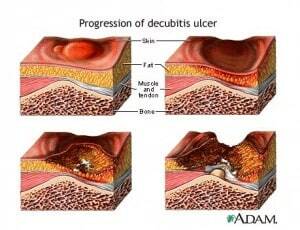 The prevention of pressure sores is a complex issue that must be incorporated by all medical facilities. Preventing the development of pressure sores can help the patients susceptible to them live easier and less painful lives. Stage I – a reversible stage, where the skin is visibly irritated with red patches. Stage II – a reversible stage where the skin begins to crack and blister. Stage III – this stage is irreversible. The sore has now evolved into a deep ulcer beneath the skin. Stage IV – a highly progressed stage of the pressure sore, left untreated, this stage can be fatal. There is severe tissue damage, with the infection extending into the bone and muscle tissue. It is easier to prevent the development of pressure sores than to treat them after they have developed, regardless of the stage. However, stage I pressures sores are easier to treat than sores that have advanced to the greater stages. Once the sore has become an open wound, it is at a great risk of infection, and by stage III and IV, the pressure sore has become dangerously infected. With some patients, pressure sores can be aggravated with just a few hours of concentrated pressure. Once infection sets in, the pressure sore become much more difficult to treat. Many times, if the infection has developed deep in the tissue or within the bone, surgery or amputation is required. The patient suffers much pain, and sometimes with advanced pressure sores, may also suffer from further complications. Prevention of bed sores requires diligence and active care, but is much simpler and easier on the patient than the treatment of pressure sores. The best way to prevent pressure sores is to have the patient move around throughout the day. If the patient is unable to move, turning them over frequently can prevent pressure sores and will also allow nurses to check for the development of pressure sores underneath the body. A soft surface, such as a foam pad, can relieve some of the pressure off the body. It is less likely to push against the body and create pressure sores. Other soft materials can be used, but this is not a long-term solution. The patient still needs to be moved around from time to time. Cleansing the body regularly can help in the prevention of pressure sores and infection. Keeping the area of the pressure sore clean is imperative in preventing further infection. The area should be cleaned gently, and petroleum jelly should be applied to affected areas, working as a water resistant agent. Nurses and staff need to follow a strict schedule where the patients are properly monitored for pressure sores. If the patients are regularly checked, pressure sores can be detected earlier and be given much easier treatment options. A hospital in Wales has successfully managed to decrease the number of pressure sores within their hospital, based on a program called Skin bundle. This program focuses on four main points in patient health care. The surface on which the patient is resting, such as the bed they sleep on or the wheelchair they are sitting in, is assessed. There is an active effort to have the patient moving as much as possible. The program also had staff members take note of a patient’s incontinence and nutrition information. These factors greatly affect the susceptibility of pressure sores, and with the proper care, can also help prevent them to a great extent.